While the bat is away, the Cat will play! Julie Newmar will be forever know as the delicious and deadly Catwoman from the Batman TV series of the 60's. Many forget that she was a glamour/pin-up queen well before her jump to the small screen. There was something about the skin-tight jumpsuits that made 60's TV a thing of beauty (need we mention Emma Peel?). 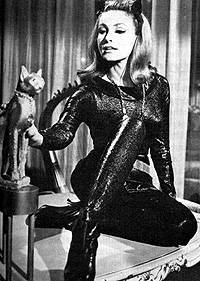 Although some argue that Ertha Kitt played a better Catwoman, Newmar knew how to turn all us tigers into pussycats.